We've got that fall feeling: crisp breezes, pumpkin spiced lattes, cozy scarves and autumn home decor galore! Dress up your home for fall with one (or many) of these DIY ideas. You'll find cozy pillows and throws, wreaths, candles and rustic fireplace decor. Time to get crafting! Continue to 2 of 34 below. This DIY wreath incorporate florals in fall tones, making this the perfect addition to your autumn-ready home. Use faux flowers to make this last season after season, and opt for air plants and a wire wreath for a stylish, modern design. Continue to 3 of 34 below. Hosting a seasonal gathering, dinner party or Thanksgiving Dinner? These chic place cards can be made from artificial leaves and reused for every event or party you put on this fall. Continue to 4 of 34 below. Add some curb appeal to your home this fall with a gorgeous DIY wreath to hang on your front door by decorating a grapevine wreath with artificial leaves and berries. Replicate these leaf napkin rings by bending aluminum wire to form a leaf and a small loop with this lovely DIY idea. Continue to 6 of 34 below. Download the iron on pumpkin spice and everything nice template to make your own decorative accent pillow perfect for your home this autumn. Continue to 7 of 34 below. Add a touch of luxury to your home with a fur pom pom throw perfect for those cold fall days. Earnest Home Co. cleverly designed a DIY fur pom pom throw blanket that is under $30 to make unlike the similar blankets that are sold in stores for $150, it will let you get the same glam look for less. DIY Luxurious Fur Pom Pom Throw from Earnest Home Co.
Continue to 8 of 34 below. 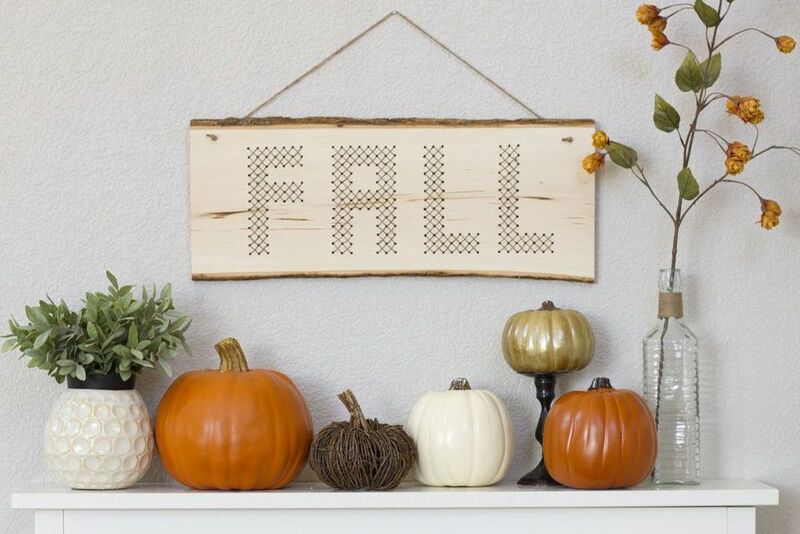 Fall is the perfect time to add some rustic decor into your home to add a cozy feeling to your home, and this DIY project would be the perfect way to decorate your home for fall with a handmade cross stitched fall sign. Accessorize your front porch for fall by hanging a new wreath on your door, and DIYing a new door mat with a decorative wreath pattern. Continue to 10 of 34 below. Enhance regular glass candleholders by stamping them with a leaf pattern to give them an elegant embossed design. Continue to 11 of 34 below. Add plenty of storage space in your living room for all the extra blankets you will need in the fall in winter to keep warm by building a sturdy wood blanket ladder to store several blankets vertically on the ladder's shelves. Continue to 12 of 34 below. This fall serve your homemade pumpkin or apple pies on a stunning raw edge wood slice cake stand. While entertaining guests this fall in your home, try serving up cocktails with these DIY feather drink stirrers, which would be a special addition to mugs of warm apple cider or mulled wine. Continue to 14 of 34 below. On a cool autumn or winter day, there is nothing better than snuggling under a warm blanket and relaxing on the couch reading a book or watching Netflix. Get ready for the cooler days, by making yourself a new warm flannel toss blanket to use in your home for under $10. Continue to 15 of 34 below. This is an easy way to dress up your fireplace mantel for fall. Wrap a regular grapevine wreath with lights and place small pumpkins in front for some quick and inexpensive seasonal decor. Continue to 16 of 34 below. Make your own fall planters using pumpkins with this DIY. It's the perfect way to incorporate some pumpkins into your home's decor this fall. From the start of September right until Thanksgiving, these DIY gold dipped pumpkins are the perfect way to decorate your home for fall. For longer lasting decor, consider using artificial pumpkins instead of real ones for this DIY project. Continue to 18 of 34 below. Paint your existing outdoor doormat with a variety of rich colors inspired by fall leaves to recreate this hand painted rug. Continue to 19 of 34 below. Give the illusion of several stacked logs in your fireplace with this creative DIY faux fireplace log stack, which will add a warm and cozy feeling to your living room. Continue to 20 of 34 below. Warm up after a long brisk day outdoors by relaxing next to the fireplace. This beautiful rustic French grain sack basket is a great way to display and gather wooden logs next to your fireplace. To make your own basket, you will need a coffee bag or french grain sack, twill fabric, a plastic insert and a few other basic crafting supplies. Create the perfect chalkboard for fall by making an apple shaped chalkboard to write down messages or a festive greeting on. Learn how to convert a wood slice available at craft stores into a red apple chalkboard for your home. Continue to 22 of 34 below. Instead of throwing out your sweater that you love that no longer fits or is torn, recycle it into a gorgeous pillowcase, so you can use it as an accent pillow on your sofa. Continue to 23 of 34 below. Get the fire going in your fireplace in no time at all with one of these handmade scented fire starters. The wick and the wax will help your fire grow, and the scented wax will fill your home with the delicious scent of cinnamon. While you are making a batch of these fire starters, set aside a few to give to neighbors as it makes a great gift. Continue to 24 of 34 below. This accent pillow is perfect for fall. Altogether it costs less than $5 to make. Use iron-on transfer paper to add the text to a blank pillow. To quickly decorate your home for fall, fill the base of a large glass candle holder with nuts, such as acorns, and place a candle on top for a quick centerpiece. Continue to 26 of 34 below. Dress up your home by adding a grouping of birch wood planters to your coffee table with this clever DIY. Surprisingly these plants are not actually growing in birch logs but recycled cans covered with birch wood scrapbooking paper to create a beautiful planter by dressing up leftover cans. Continue to 27 of 34 below. Make a new pillow cover to freshen up an existing toss cushion with this DIY that is the perfect home accent from fall throughout winter. Continue to 28 of 34 below. Learn how to keep all your flowers in place in your fall flower centerpiece by using these tips from Lia Griffith. Add rustic fall decor to your living room by gathering cut birch logs or branches of leaves in a container and creating a rustic palette inspired fall sign to create a beautiful vignette. Continue to 30 of 34 below. After returning home from a brisk walk outdoors on a fall day nothing can be better than warming up with a warm fall drink. To add extra festive flair to all your fall drinks make your own fall leaves mugs with this DIY idea that uses a stencil and a white mug. Continue to 31 of 34 below. You can easily add some fall decor to your home by printing this free printable art, which describes some of the glorious things of fall. Once printed just take the print and frame in an empty frame and hang on the wall or lean against a mantel to display the art. Continue to 32 of 34 below. Dress up your fireplace mantel ​by hanging a handmade rustic wheat wreath that you can make by using two colors of dried wheat. Fill your house with the delicious spicy scents of fall by spending some time baking pumpkin bread to give to your neighbors, family or friends. Once done you can package up your homemade loves with this free bread label that you can print and wrap around the loaf to package it up with a fall greeting. Continue to 34 of 34 below. Send a card to a friend to announce the start of pumpkin spice season and invite them to join you for some pumpkin spice lattes with this easy to make fall greeting card.